The S-400 Triumf is a mobile medium- and long-range air defense system. The S-400 began development in the 1990s and was first deployed in 2007. The system uses four different types of interceptors to destroy various airborne targets and also has the capability to use some S-300 legacy missiles. The first interceptor is the 48N6E3, a modified version of the 48N6E2 that is used in the S-300P systems, and has a range of 250 km. The second is the 40N6, which has the longest range at 400 km. It is believed the 48N6E3 and 40N6 are used primarily to target stealth aircraft, cruise missiles, and drones. The third is the 9M96E which has a range of 40 km and a max altitude of 20 km. The fourth is the 9M96E2 which has a range of 120 km and a max altitude of 30 km. The 9M96E and 9M96E2 are believed to target medium-range ballistic missiles at a range of 60km, but also aircraft, cruise missiles, and drones. The 9M96E and 9M96E2 missiles are also smaller, allowing four to fit into one S-400 missile container. Therefore, one erector launcher vehicle for the S-400 system is capable of carrying 4-16 missiles depending on the missile variants fielded. A battalion of the S-400 includes a command-and-control vehicle, engagement and acquisition radar vehicles, and eight launch vehicles with a total of 32 – 128 missiles. The acquisition radar of theS-400 is a modified version of the same Big Bird radar used by the S-300 system, but has a detection range of 600 km. The S-400 system is believed to be able to and engage up 36 targets simultaneously. S-400F The S-400F is the ship based version of the S-400 Triumf air defense system. 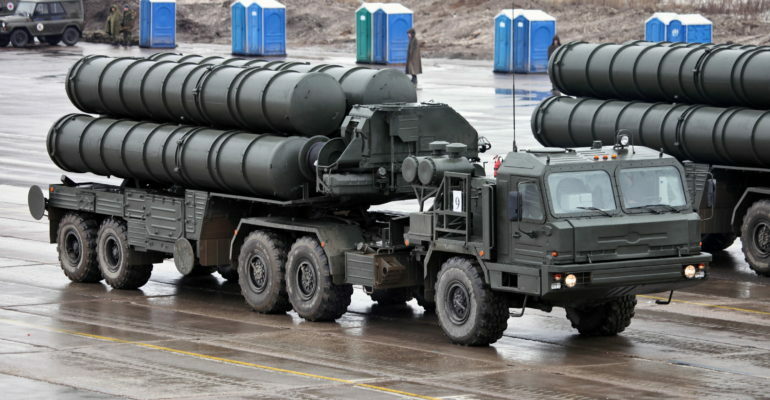 It is expected to use the same missiles as the S-400 Triumf, with the exception of the 40N6 missile, indicating that the expected range of the S-400F system would be up to 250 km. In 2010 the Russian Navy planned to modernize and equip three of its suspended Kirov class nuclear-powered missile cruisers with the S-400F system. The first ship undergoing the modernization effort is the Admiral Nakhimov. Conflicting reports indicate the ship is expected to complete its modernization and enter into service between 2017 and 2019. Reports have also indicated the modernization of the two suspended Kirov class ships may be cancelled because of funding limitations. Finally, when the Admiral Nakhimov enters back into service, the currently operational Petr Veliky is expected to undergo a modernization program that will include replacing its S-300F and S-300FM systems with the new S-400F system.